Super? Scary? Super scary, or just plain silly? This weekend, thousands of runners will head out to a local Halloween race but answering the question “what to wear?” requires more than a quick check of the weather. 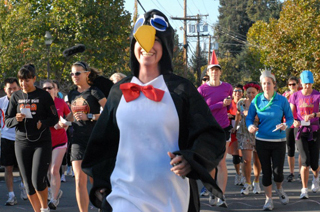 It’s costume time and we’ve taken a look at some of SignMeUp’s online registration client’s Halloween-themed races to bring you the seven best. These aren’t just costumes, they’re costumes made to run! 1. It’s a bird, it’s a plane, it’s the super heroes! These guys had the right idea when they picked out something to wear. Not only can these costumes move, apparently they’ve got super powers that guarantee a strong finish. 2. Cereal! Not serial (as in killer). 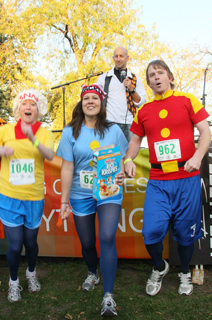 Snap, Crackle and Pop ran the Pumpkins in the Park 5K in Chicago’s Lincoln Park. Even though this is an afternoon event, these costumes look like just the thing after rolling out of bed for a 5K. As an added bonus, these runners could snack on their breakfast fave throughout the run. The Pumpkins in the Park 5K is put on by the folks at Fleet Feet Sports – Chicago. The sold out 13th annual takes place this Saturday (10/27/12) and will feature a kids race, costume contest and a post-race movie in the park! 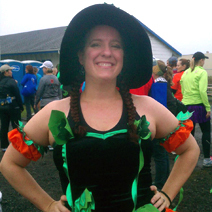 Maryalicia Verdecchia picked a winning costume to wear at the inaugural Runaway Pumpkin Half Marathon in Lebanon, Oregon. She ran as the runaway pumpkin herself and won the costume contest! This year’s event, the second annual, takes place on Saturday (10/27/12) and benefits ABC House – Child Abuse Assessment Center. Where’s Waldo!? 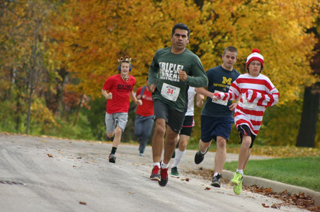 No Halloween run would be complete without someone in these famous red stripes. This kid looks comfortable in his costume and seems to be keeping pace at the Mooseheart Monster Mash 5K in Mooseheart, Illinois. This year’s event took place last Saturday (10/20/12). He’s got the toque, he’s got the jacket, it’s a recipe for a magnificent run at the Ghosts & Goblins 5K/2K & Wellness Fair in Carmel, Indiana. The fourth annual event, managed by long-time SignMeUp online registration clients, Vision Event Management takes place this Saturday (10/27/12). Black and white never goes out of style, especially at the Ghost Run 5K hosted by Fleet Feet Sports – Menlo Park in California. This year’s event takes place on Saturday morning (10/27/12) and features a costume contest and a ghost chase. You can’t go wrong supporting your team while you’re on the run. 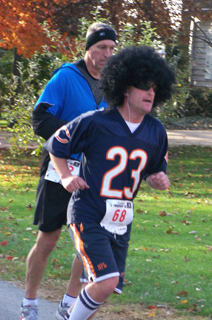 This guy hits his stride at the FraidyCat 5K and Meow Mile in Oswego, Illinois. This year’s second annual event takes place on Sunday (10/28/12). 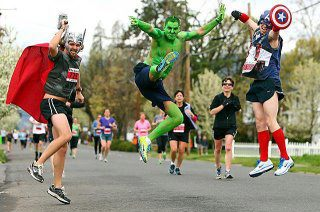 What is the best costume you’ve ever seen on the run? Share your best Halloween event photos on our Facebook page!